I have an opinion on the renaming issue, one I formed more than twenty years ago when I lived in the adjoining neighborhood of East Colfax. That opinion has only been reinforced by time. I believe it is in the best interests of both the neighborhood as well as Denver to rename Stapleton. I feel this in my gut; yet the lawyer, judge and law professor in me insist that I think through this problem critically, in a rational, well-informed, compassionate way. That effort is what I offer here. To some, the name Stapleton does not signify the Ku Klux Klan or Mayor Benjamin Stapleton. It does not mean anything other than the name of the place where they live or work. These people tend to feel that others should stop bringing up this unpleasant problem that reflects poorly on our City and its reputation for being socially and politically liberal. To some it means the name of an airport they remember fondly. They have heard that Benjamin Stapleton may have been a Klansman, but didn’t he denounce the KKK eventually, and thus redeem himself? To others the Stapleton name is an insult to those who fought the KKK and suffered under its rule—whether in 1920s Denver or in other places and times. To them, retaining the name signifies indifference to the suffering of Jewish, Catholic, and African American ancestors and those traces of bigotry that remain today. The name becomes another burden to carry—a symbol that they are forced to face every day outside their front door—a reminder of all the places where their people were made to feel that they did not belong. How do we explain to our children, they ask, who Stapleton was and why a community is known by his name. How can the aspirations of diversity and inclusivity expressed in The Green Book be reconciled with the aspirations of Benjamin Stapleton? What does it say about us if we retain such a community name?. And there are those who are unaware of the controversy, those who are aware but do not care, and those who are concerned with hypothetical and ethical questions, or believe we should move more slowly. How will businesses deal with a name change? And will changing the name re-write history? How poor a mayor could Stapleton have been if he was re-elected so many times? And what about the slippery slope? If we rename Stapleton, then shouldn’t we also rename Thomas Jefferson and George Washington High Schools—which honor slaveholders? Many ask how this community naming was ever allowed to happen in the first place, expressing the feeling that they might not have bought their houses if they had known the development was named for a KKK mayor. Given the many complex questions, and to respect others’ points of view, we have to ask exactly which issues are most important here and what weight we give to them. How do we develop principles for how the renaming question should be resolved? It is helpful to look at what others have done with renaming controversies elsewhere and see if the principles used in those cases can be adapted for our use. I am borrowing ideas and language used in two reports. In 2017 a committee was established at Yale University to develop principles for deciding whether or not to rename Calhoun College, whose namesake was actively pro-slavery. In 1987 Colorado historian Patricia Limerick authored a report on the renaming of Nichols Hall, a University of Colorado residence hall named for a captain who led his company in the infamous 1864 Sand Creek Massacre of Arapahoe and Cheyenne people. Both reports acknowledge that historical figures were morally complex individuals and we should judge them carefully, especially if the place in question has been named for someone who made major contributions to the place itself. The Yale University report notes that historical names create continuity in the symbols around which people in a community bond through generations and with a place, and thus should not be replaced lightly. On the other hand, the Limerick report notes, sometimes renaming on the basis of values is warranted. Judging a person by the mores of a past era can be balanced with the ongoing criticism of history as seen from the present perspective. It would be inappropriate to name a community in honor of a person if his primary legacy is fundamentally in conflict with the mission and purpose of the community. If renaming will have the effect, in a meaningful way, of “erasing history,” then there is a responsibility to address that erasure. The KKK Era of 1920-1925, during which time Mayor Benjamin Stapleton, first elected in 1923, was a member of and supported by the KKK. The Stapleton Development Era (1995-2001) when the developer, Forest City, adopted Stapleton as the “initial name of the community,” and inserted the name Stapleton in the official company logo. 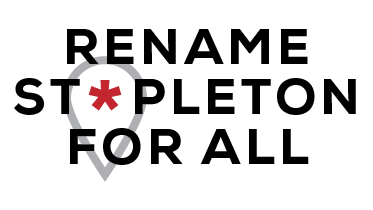 The present (2014-2018) when activists began organizing to rename Stapleton in light of heightened political awareness and racial dissension nationally and locally. One might argue that it is unfair to judge Benjamin Stapleton according to today’s social values, yet there are certain dynamics in history toward which we should not adopt an uncritical point of view. One of those dynamics is an ingrained nativist populism that rises from time to time in U.S. history, which attempts to define certain classes as not “real Americans,” or as unworthy of protection and place. In his own day Stapleton was controversial precisely because of his KKK connections and his doubletalk about them. During his successful 1923 campaign, he denounced racial prejudice while at the same time he relied on the Klan’s financial and political support. In 1923 when critics learned he was a KKK member, a recall election occurred. Then Stapleton went public with his support of the Klan, promising at a rally on Table Mountain: “I will work with the Klan and for the Klan in the coming election, heart and soul. And if I am re-elected, I shall give the Klan the kind of administration it wants.” With Klan financial backing and its grass-roots political support, Stapleton survived recall and appointed Klansmen to significant city positions. However, the next year he balked under the strict control of the Grand Dragon, John Galen Locke. Later when Locke was investigated for tax evasion and jailed, the Klan split. Then Stapleton turned on the police department and fired its KKK chief. As a result, the Klan ousted the mayor —not the other way around. A “primary legacy” is one that has “lasting effects” that cause Stapleton to be remembered–by historians, by citizens today, and in his own time. Stapleton became a popular mayor, as evidenced by his many re-elections after he was ousted from the Klan, but he also had significant opposition. Stapleton was admired as “Ben the Builder,” because during his tenure significant public facilities were constructed. Some historians might say these places are his primary legacy, but unfortunately, that legacy is tarnished by the effect of his KKK years. That is the legacy Stapleton is best remembered for now. Is that legacy fundamentally in conflict with the mission and purpose of the Stapleton community today? The Green Book authors aspired to have… communities that promote diversity . . . Stapleton will be a place of economic, social and environmental innovation that will provide a new development model for the region . . . the Plan seeks to reunite the Stapleton site with adjacent neighborhoods in Denver, Aurora and Commerce City. Having a community name around which people can unite in pride and confidence fosters community, a task made more difficult where a namesake’s principal legacy (collaboration with KKK) clashes with the community’s mission (tolerance and diversity). For children, the name requires them to form their childhood ties and memories around a name that they had no part in creating and whose legacy offends. Stapleton was mayor when the federal government expanded the Denver Municipal Airport into an international airport during World War II. It is almost by happenstance that his name is associated with the current community. The only connection is that the development is on the site where Stapleton Airport once stood. The naming of the airport was intended to honor Stapleton; the naming of the development was not. The developer declared Stapleton as “the initial name,” and created a process for making such a name change. 12 These provisions support the view that the name was never intended to be permanent. The Yale report recognized that there are different kinds of public spaces, and residential ones are most distinctive because where people call home has special meaning, especially for children. They use the Stapleton name every day and it becomes a part of their lexicon: the Stapleton team, the Stapleton school, and the Stapleton whatevers. Another factor is that the offense given by the name Stapleton is not evenly distributed across the community, and thus a namesake whose legacy is connected to , anti-Semitism, anti-Catholic, and anti-immigrant bigotry, and white supremacy burdens some neighbors more than others. This is an unfair, if unintended, consequence of the name, acknowledged even by some who do not feel burdened by the name, but who are concerned that their neighbors might be. Changing the name of the Stapleton community does not erase the memory of Benjamin Stapleton in Denver’s history—quite the contrary. The name change actually unearths the complex history of the man, the city, and the place currently known as Stapleton. However, to the extent that some feel that changing the name “erases” Stapleton’s place in history, then a commemorative plaque could be installed in an appropriate place describing the quandary around evaluating Stapleton’s legacy—his connection to the KKK along with the credit he deserves in developing certain city facilities, parks and airport. Such a display could be coupled with periodic events to raise and maintain awareness. Using this principled, evidence-based approach to decision-making, I feel confident that my instincts about changing the name are valid and will stand the test of time. People living in the same time and space as Benjamin F. Stapleton voiced the opinion that that the Klan and Stapleton were morally repugnant and they expressed their concerns about Stapleton in the light of social justice. It is not historians or “political correctness” that foist these judgments on historical figures. Rather, historians offer us lessons about the recurring danger of opportunistic politicians who pander to racist and nativist views. Furthermore, to name a community in honor of Benjamin Stapleton, whose primary legacy is seen today as his collaboration with the KKK, conflicts with the stated mission of promoting diversity in the Stapleton community. Finally, if any unwarranted erasure of Stapleton’s history occurs in the process of renaming the community, then remedial measures can be adopted along with programs to remind us of the hard lessons of political pandering. Keeping the Stapleton name does nothing to help us learn from the past, to build community, or to face the moral complexities of that name. It merely has the effect of rendering the neighborhood inhospitable, not only to African Americans, but also for those Jews and Catholics who understand their own history of oppression by the KKK–and not only to these three groups, but the name is also offensive to their allies, extended families, their neighbors. It is not white guilt that advocates for the name change. It is caring and a sense of the injustice of continuing to honor Benjamin F. Stapleton from generation to generation into the future. In my view, Stapleton’s actions in enabling the Klan mean that he has forfeited that honor. If that was not understood back in his day, in the current era, after the struggles this country has been through and continues to face in combating race and religious bigotry, it should be understood today.